Looking for a little inspiration to get you into the Hygge mood this holiday season? Below are our 5 favourite Scandi IG accounts that are perfecting Holiday Hygge. Cue warm knits, fireside Fika and dreamy interior inspiration! We love @wunderblumen’s super Scandi home, and that she loves to share it with us! Follow her for plenty of interior inspiration for keeping your interior hygge this winter. We love the focus on the beauty of home and family life. For lazy sunday morning style interior shots, follow @baratess. An interior & styling editor from Stockholm, her feed brings a sleepy element with dusky colours and natural interior textiles. Ruke is a knitted fashion brand, and their feed definitely makes us want to snuggle up warm! Cue gorgeous shots of their knitwear and inspiration for wrapping up and relaxing. For those who appreciate a good foodie flat-lay – look no further than @Signebay. This Copenhagen stylist is truly embracing the Autumnal hygge style with a combination of food, interior, and lifestyle shots. If you’re a fan of beautifully styled flowers too, there are some truly inspiring shots on this feed! 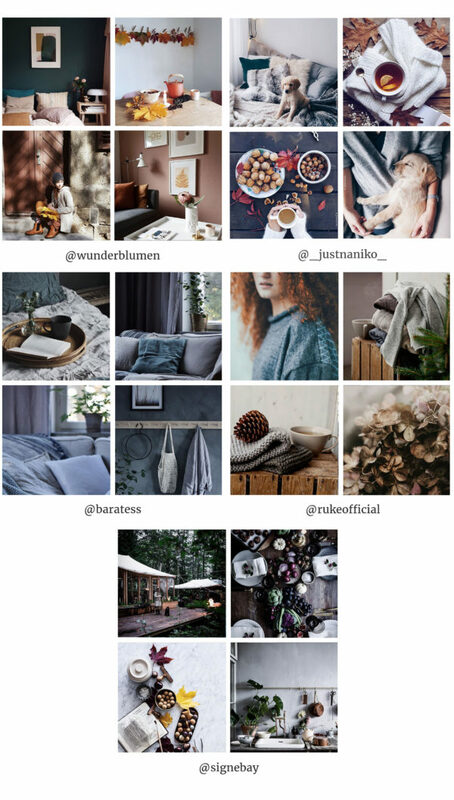 For more Hygge inspiration, follow our ‘Head to Toe, Warm and Snug’ board for personal style inspiration, and ‘Autumn Interior Neutrals’ for your home!